April 14, 2009, my second album #Vipassana was officially released on innova Recordings. Conceptually more ambitious and complex than anything on my first album in 2003, composing “Vipassana”, a 60-minute interconnected four movement large ensemble work, crystallized and synthesized many of my thoughts at the time on fusing contemporary classical music, popular music, and improvisation into something singularly different than any of those genres individually—although it would be another two years before I came up with the term #mixedmusic to help describe such blending of influences into one vision. There have been so many great musicians who performed the work over five years—we performed the piece at least once every year between 2005 and 2010 (think I’ll need to have revival someday)—many continue to perform with me to this day! “Vipassana” also opened my way forward to other musical opportunities (which still are happening) but also it allowed me to create the Numinous I always dreamed of having years before I even came to NYC: a large ensemble, through whose incredible support and talent, gives me an amazing chance to realize many of my most grandest musical visions. There’s much more to come with Numinous, all thanks to “Vipassana”! —————— “The word vipassana comes from the Pali language of early Buddhist texts. It means ‘to see things as they are’ but it is often translated as ‘insight’ or ‘clear-seeing’. The type of seeing denoted by vipassana is that of direct perception or observation, as opposed to knowledge derived from reasoning or argument.” —————— #numinous #numinousmusic #josephcphillipsjr #insidevipassana #insidenumious #thisdayinNuminous #10yearsago #10yearsagotoday #innovarecordings #innova #deniselevertov #contemporaryclassicalmusic #blackical #classicallyblack 1 week 1 day ago. Still large ensembling 10 years later... Looking back now, I can see 2009 was a watershed year for me. My blog was 🔥(or at least I thought so); I was holding forth with a monthly Composer Salon gathering in Brooklyn; the Composer Collective I founded 5 years earlier, Pulse, was at its peak-with a performance that year of a song cycle with and for Joy Askew celebrating the Hudson River and the 400th anniversary of Henry Hudson's journey; I had TWO wind ensemble commissions to premiere with two different universities within two months of each other, that I conducted (St. Olaf College & University of Maryland School of Music); my large ensemble composition “Vipassana” was released on innova Recordings in April 2009 with my group Numinous—2009 was our ninth year and our second album (the top photo was from a fall performance, our second of the piece that year); New Amsterdam Records first connected with me, beginning some long friendships and collaborations; and even though some years it didn’t feel like it, with the first-time PR hiring of Bucklesweet, that year began a slow, but steady upward musical opportunity & career trajectory that continues to this day (Thank you Amanda!). The bottom photo is from “The Grey Land” premiere this past fall—we’ll be in the studio soon to record the #monoopera for my fourth Numinous album. 2009 📸: Donald Martínez at Brooklyn Lyceum, October 28, 2009 2018 📸: Daniel Wolf at Roulette, October 16, 2018 #numinous #numinousmusic #vipassana #thegreyland The Grey Land #mixedmusic #newmusic #classicallyblack #newopera #contemporaryclassicalmusic 3 months 5 days ago. Numinous updated their cover photo. The Grey Land premiere October 16, 2018 photography by Daniel Wolf courtesy of Roulette Intermedium Roulette 4 months 2 weeks ago. #TBT One of my long standing goals is to write music for feature films. Not to be an exclusive “film composer”—where ones main artistic outlet is to compose for movies—rather I’d like to have a more than occasional chance to write distinctive music that enhances and uplifts another’s visual language and vision, while also still creating compositions and projects (like The Grey Land) for #Numinous & beyond. While I have the inclination, ability, and desire, I don’t have the typical connections that lead to getting the opportunities (A few years back I wrote in a Numinosum blog post about opportunity: “A Not So Mixed Music”). In an industry not known for stellar open windows behind the camera for blacks, women, & other POC, I’ve always believed my path toward that goal will be something unorthodox. • • Back in 2012 I was commissioned by BAM to write music for a restored version of Ernst Lubitsch’s 1922 “The Loves of Pharaoh” and I conducted Numinous live for three nights with a screening of the film. Despite some unnecessary outside "challenges", overall it was a transformative experience, musically & artistically, with 100-minutes of some of my best music to date—even listening last week for first time in a couple years (hence the post)—and only served to increase my desire to write for films. I’m still hoping to fulfill my childhood goal, to someday having my music be an integral, powerful, and necessary element to some interesting auteur’s cinematic independent vision (or some comic book blockbuster—like if Ava DuVernay called me to score #NewGodsmovie—either would be good with me 😉) • • Video from “The Loves of Pharaoh”, October 2012 See my Youtube channel (numinousmusic) for more Pharaoh. From Act 1 from "The Loves of Pharaoh" new score by Joseph C Phillips Jr. 5 months 1 week ago. In the run up to last week's premiere, from New Sounds: https://www.newsounds.org/story/joseph-c-phillips-jr-numinous-roulette/ 6 months 3 days ago. In the Pali language of early Buddhist texts, vipassana means "to see things as they really are." Today, vipassana is a type of meditation that seeks spiritual clarity and insight through silence. Wanting to reflect the essence of that quietude in music, composer Joseph C. Phillips Jr. created Vipassana. 1. Of Climbing Heaven and Gazing on the Earth: inspired by a photo from Yann Arthus-Bertrand's traveling outdoor photography exhibition, Earth from Above. 2. Stillness Flows Ever Changing: a river of sound creating waves of melodies that dance and weave around each other. 3. Into all the Valleys Evening Journeys: influenced by the "hero's journey" illuminated by Joseph Campbell in his book The Hero with a Thousand Faces. 4. The Nothingness that is the Source of Everything: partly inspired by one of Bjoerk's Selmasongs as well as a song from Gustav Mahler's Rueckertlieder and featuring Denise Levertov's poem Variation and Reflection on a Theme by Rilke. As with much of Mr. Phillips' music, Vipassana humbly seeks to create a sense of wonder and beauty that inspires and enlightens. Vipassana is performed by Mr. Phillips' ensemble Numinous, a collection of some of New York City's finest new music, classical, and jazz musicians. Composer Joseph C. Phillips, admirably aided by the ensemble Numinous, delivers a stunning 18 minute performance here, blending elements of Steve Reich and Pat Metheny and other sources of inspiration into one of the freshest recordings of the year. Imagine Reich's Music for 18 Musicians, but with an expanded harmonic sensibility, a jazzier pulse, and occasional hints of sweeping Maria Schneider-esque melodies. The individual ingredients are familiar, but I guarantee that you haven't heard them put together in this way before. For want of a better term, let me call it über-minimalism. Phillips' writing is brilliant, and the ensemble performs it with clarity and passion. Count me as a believer. 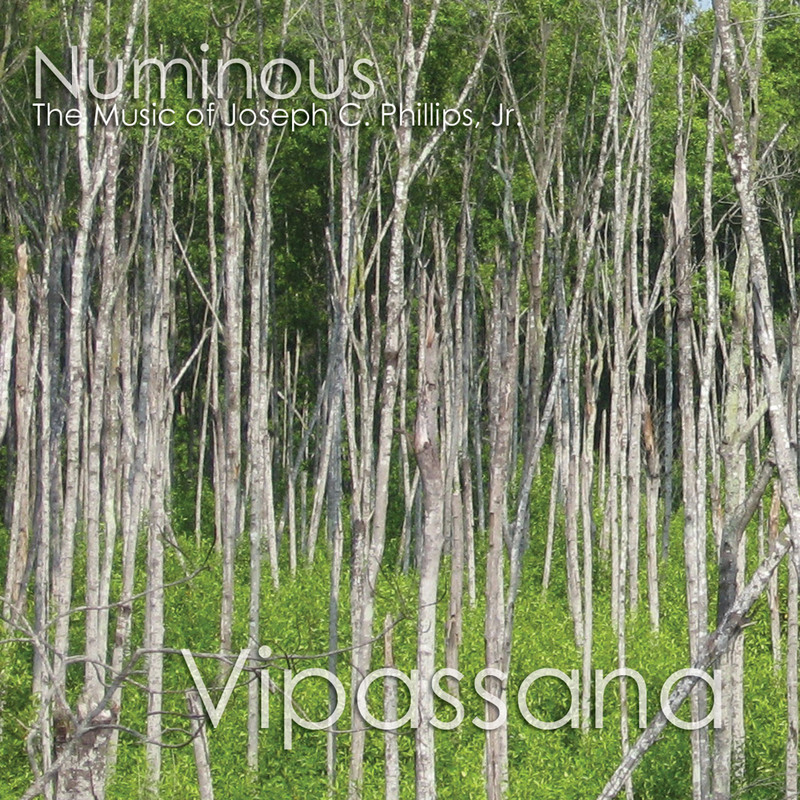 And I just got a copy of a (still to be released) CD earlier this week that knocks my socks off . . Vipassana: Numinous Plays the Music of Joseph C. Phillips, Jr. Imagine Steve Reich collaborating with Maria Schneider . . . If you get a chance to hear it, check it out. It starts out sounding like something inspired by “Tubular Bells”, but surprise, it’s an interpretation of Buddhist texts set to music. A fusion of contemporary classical, jazz, new age and other left leaning musics, this is certainly head music for the cerebral, but it’s a dandy listening date for people that really like their alternative stuff from left field. More of a spiritual descendant of “Music for 18 Musicians” than anything else, it has the appeal of that dense work but takes you to a different place. Wild and worth it. In the Pali language of early Buddhist texts "vipassana" means "to see things as they really are." The word is also translated as "insight" or "clear-seeing." It's a spiritual process based on instinct and intuition rather than reasoning and intellect. In short, Vipassana is the road to the most profound level of understanding. Vipassana is a recording that captures the fluid and organic fuison of elements from contemporary classical, jazz, and popular music. ...Indeed, Phillips continues on the paradoxical track by which he defines himself without any clear definition. ONE THING IS FOR SURE.... HE CONNECTS WITH THE AUDIENCE!! On Innova's Vipassana, composer Joseph C. Phillips Jr. leads the ensemble Numinous through his four-part composition of that name. Vipassana is a word most frequently used in the context of Buddhist mediation, signifying seeing through direct perception rather than through second-hand observation. Phillips' hour-long composition Vipassana is not meant as music to accompany the activity of meditation so much as it is itself a meditation on, and voyage through, various visual stimuli, though the last piece departs from that model in that it envelops a setting of a poem by Denise Levertov. Musically, this quartet of stylish and provocative pieces stands somewhere between the style of Steve Reich and contemporary jazz, though parts of it are texturally much busier than Reich and the use of improvisation is fairly restrained, limited to solo space to spotlight some key players in the ensemble. The ensemble Numinous contains some names familiar from the downtown scene in New York, such as cellist Jody Redhage, violinist Ana Milosavijevic, trumpeter Dave Smith, and trombonist Deborah Weisz; Smith gets a plum solo spot in the third piece, "Into all the Valleys Evening Journeys." Julie Hardy sings the poem in the last piece, "The Nothingness That Is the Source of Everything," very pleasantly, and while this is not ambient music, the sense of music-making throughout is relaxed, dedicated, and for the most part, calm. For some listeners, Vipassana — at least in its early stages — will seem too derivative of Reich and they may not be able to move forward with it. However, Phillips is taking the long-term view of such input, asking "what might be the next step" rather than merely imitating the model; he folds it into a blend that succeeds in being the sum of its parts and to illustrate his program, which is an unusual one: part symphonic, part spiritual exegesis, and partly developed from a love of particular instrumental combinations. There are certain kinds of harmonic shifts that Phillips prefers, and after listening for awhile you might come to expect them. Nevertheless, Vipassana is never less than likeable, is sincere in intent, and is greatly enjoyable to listen to; Joseph C. Phillips Jr. is a young composer to watch. Composer-conductor Joseph C. Phillips, Jr. has a way of making his ensemble, Numinous, sound even larger than its 25 pieces. A hypnotic rhythmic undertow guides his music and is informed by influences from the world of literature, philosophy and religion. Phillips shares a taste for the nuances, the sensitivity to the more subtle nuances, the search for a sound liquidity. ...a twentieth century composer, who has a spiritual understanding of himself and the past, created Vipassana. His ability to express a culturally diverse composition style that will fit into any true music lover's collection.